Are you familiar with “the mother’s curse?” It kind of goes like this: I hope when you grow up you have kids just as bad as you. 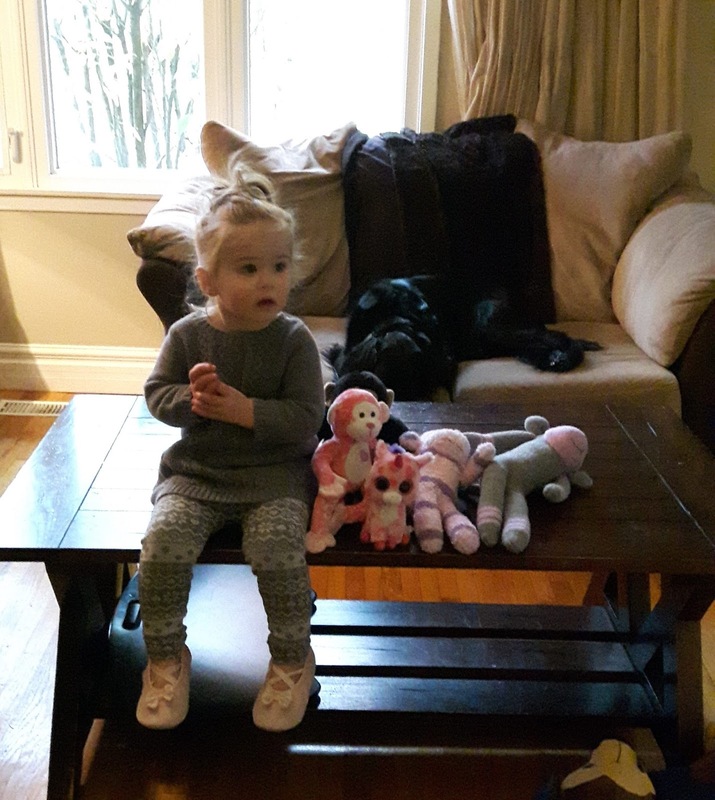 That picture was taken just before she stood up on the coffee table and booted the monkeys off, one by one. Monkeys flying everywhere! Thursday and Friday last week the son-in-law had to fill in for someone at work, so my babysitting time doubled. What’s cute when you babysit for 2 ½ hours (which includes the beginning of nap time) is exhausting when you babysit for 5. And to make matters worse, it was too wet and cold to play outside. On a whim I Googled “mother’s curse” thinking to discover the source of it. Imagine my surprise when the feed filled up with all this scientific jargon regarding a real mother’s curse. It’s some kind of genetic anomaly that’s passed down from mothers to their sons - only the sons, not the daughters. I didn’t understand a fraction of what it’s all about, but if you’re interested in the science of it all, you can learn more at Phys Org. This week the daughter is off to another convention, so it’ll be full time babysitting for most of the week. But the upside is I’ll get to use her car, so even if the weather’s bad we can still go to story time at the library and play group at the YMCA. And you’d think I would have had enough of the kid with the extra babysitting, but no, I went with her to our local comic con on the weekend. 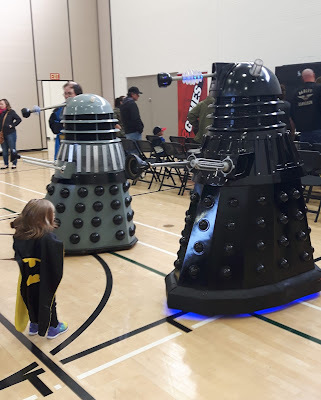 She wore her batman outfit and she and her trusty monkey were ready to protect us from the Daleks that were wandering around causing trouble. Other highlights of last week include going to Oshawa to meet my favourite author, Charles de Lint. It was an amazing experience and I’ll be writing a separate blog post all about it soon. And finally, yesterday I spent the day working on the grandbaby’s Halloween costume. She’s going to be the cutest little Ewok out there. I was able to get the main part finished in one go - basically, a brown sleeper made out of arctic fleece with a hood (with ears on it) and feet. The pattern turned out to be a little trickier than I expected, but it turned out okay. Now I just have to figure out how to do the head scarf.